The Robert D. and Billie Ray Center at Drake University will honor Casey Blake, former Major League Baseball third baseman, at an all-star evening that features ESPN anchor Chris Hassel and dozens of other special guests from the worlds of sports, television, and politics. “An All-Star Evening to benefit CHARACTER COUNTS!” will begin at 5 p.m. Friday, April 15, at the Prairie Meadows Event Center. The event is a fundraiser for The Robert D. and Billie Ray Center, Iowa’s home for the CHARACTER COUNTS! and Excellence with Integrity programs. Blake will receive the 2016 Robert D. Ray Pillar of Character Award, an award presented annually to an individual who consistently demonstrates good character as a public role model. Other special guests include NFL linebacker Pat Angerer, TV actress Bridget Flanery, former U.S. Ambassador Mary Kramer. A list of more than 40 influential attendees is available on the event website. Hassel, a Muscatine native who launched his sports journalism career in the Quad Cities and worked as a broadcaster in Des Moines prior to joining ESPN in 2013, will be the latest in a star-studded string of ESPN representatives who have attended the benefit, including last year’s guest, SportsCenter anchor Linda Cohn. 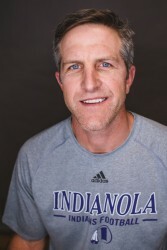 Blake grew up in Indianola, and continues to support his hometown—where he lives with his wife, Abbie, and their six children—through a variety of youth sports camps and other philanthropic efforts. In 2010, the Blakes formed the Indianola Community Youth Foundation (ICYF) to give back and build on Indianola’s reputation as a community committed to its youth. The first goal for ICYF was to match the Blakes’ $1 million donation in order to provide at least $2 million toward additional Indianola facilities. The Blake Fieldhouse opened to the public August 2012. The benefit is chaired by Kathryn M. and Randy Kunert and Mike and Michele Gartner. All of the funds raised at An All-Star Evening will support the character and leadership development projects of the Ray Center. For more information, call 515-271-1910 or email hilary.ortmann@drake.edu.